Description The adult louse resembles a miniature flat ant. They have a head, thorax and abdomen with six legs, but their two front legs are very large in order to grab onto the hair shafts. Head lice are tan to greyish-white in color. Life cycle Lice eggs on the hair very close to the scalp are the primary sign of an active infestation. A female can lay up to 50-150 eggs in her life, but it can lay up to 100 eggs in 30 days. She also glues her eggs, sometimes called "nits", which look like tiny white beads, to hair shafts very close to the scalp (usually about a centimeter or two [half an inch to three-quarters of an inch] from the scalp). Eggs are very small, about the size of a period ".". Eggs may appear white, yellowish, brownish or greyish, but are almost always lighter colored. An egg normally undergoes a 7-9 day incubation before hatching as a baby nymph. It can be passed to adult to child or child to adult. Head lice have no wings and move primarily by crawling. They have no adaptations for jumping. 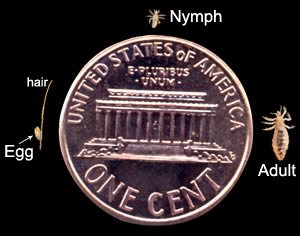 There are three main stages in the life of a head louse: the nit, the nymph, and the adult. Nymph: The nit hatches into a baby louse called a nymph. It looks like an adult head louse, but is smaller. Nymphs mature into adults about 7 days after hatching. To live, the nymph must feed on blood. It metamorphoses 3 times before it reaches the adult stage. Most head lice at this stage are almost transparent until they have eaten (sucked blood from a human skin). Then they can be seen more easily since it will be possible to see the tiny amount of red or brown blood in their stomach. To the unaided eye, it will appear like a small red dot usually about 0.5 mm or less in diameter. With a magnifying glass or microscope, it is possible to see the head and legs, and since a louse is quite transparent at this stage, the digestive system, showing the blood that was ingested. Adult: To live, adult lice need to feed on blood. Females are usually larger than males, and can lay several nits in a day. If the louse falls off a person, it usually dies within 1-2 days, although experiments have shown them to live longer. A female may continue to lay eggs on other materials similar to the texture of human hair such as stuffed animals with long strands of hair. Head lice are becoming indestructible. A study found that as many as 80 percent of the bugs are immune to insecticides in over-the-counter shampoos, and resistance will only increase. Evolutionary biologist Dale Clayton may have a new line of attack. The above combined with a vinegar rinse solution ought to make head lice a thing of the past. See Lice in the Library of DirtDoctor.com.